Course Description: This course consists of one (1) module. Students will be introduced to breakeven analysis as a management tool and learn how to calculate the breakeven point using both the formula and box method. Students will also be introduced to contribution margin and how it is used to determine either the dollars required or the number of units that need to be sold to breakeven. Throughout this course, students will be given the opportunity to practice breakeven analysis skills through a variety of scenarios. Course Description: Bowling Basics provides information on the origin and history of bowling, bowling center structures, bowling basics and bowling center safety. Bowling basics provides information to include how to select and hold the ball, why bowling shoes are important, and how to begin your approach before you release the ball. Course Description: The MWR CYMS (Child and Youth Management System) course provides an overview of what CYMS is, who uses CYMS and why CYMS is important to CYS and the Army mission. Module one provides students with information on CYMS functions to include navigation techniques using the CYMS menu bar, function buttons, and hot buttons. It also details useful keys and shortcuts to performing daily functions within CYMS. Module two consists of interactive simulations on entering a household, issuing a PASS, enrolling children in classes and running CYMS reports. The knowledge checks test your skills in performing these functions. Target Audience: Family and MWR Staff who use CYMS software. Course Description: The Family and MWR Commercial Sponsorship Course is aimed at giving Family and MWR Commercial Sponsorship professionals the skills they need to run a successful sponsorship program. This eight module course covers all aspects of commercial sponsorship in Family and MWR from history and regulations to pricing methods to writing successful proposals. ACE Recommended Credits: In the lower division baccalaureate/associate degree category, 2 semester hours in Hospitality Management or Marketing and Sales. Course Description: In this open enrollment online course, students will review SAFER practices to apply CY Services accountability regulations, standards and requirements to ensure child and youth accountability and supervision while children and youth participate in Army Child and Youth programs. Apply protocols for child and youth accountability during emergency situations (e.g., drills for shelter in place, fire, tornado, etc. ), field trips, during times of movement and during staff transition. Course Description: This online course teaches CYS staff how to ensure continued care and supervision for children and youth during deployments, natural disasters, and emergencies. Based on the highly-regarded MAC Workbook and consultation with a variety of experts, the CYS Mobilization and Contingency Course is designed as a practical exercise for developing an actual Mobilization and Contingency (MAC) Plan. Students will interactively analyze the local Garrison environment, develop a plan, then learn how to monitor, implement, and evaluate it. Expanded course information includes prevention and containment strategies for a pandemic outbreak. Course Description: Reducing the Risk of Child Abuse in Army CYS Settings provides valuable insight for anyone that may work with children. This course provides information on how to identify child abuse inside and outside of our own facilities and how to keep Army children safe. The course will review Army guidance, child abuse identification, child abuse reporting and appropriate interactions with children. Target Audience: Child & Youth Services and FMWR employees that may work with children. Course Description: The CYS Space Census: CDC course provides information on the CYS Space Census in general and the CDC Space Census in particular. Students will gain a better understanding of the Space Census and learn how to complete a successful Space Census for Child Development programs. The Space Census includes four types of calculations: Actual Capacity, Adjusted Design Capacity, Operational Space Capacity, and Compensatory Space Capacity. This course provides ample coaching and hands-on practice completing the various Space Census worksheets. The course contains four modules, with a total of 11 lessons, each requiring 30-45 minutes to complete. Course Description: The CYS Space Census: FCC course provides information on the CYS Space Census in general and the FCC Space Census in particular. By taking the course, students gain a better understanding of the Space Census and learn how to complete a successful Space Census for Family Child Care programs. The Space Census includes four types of calculations: System & Cumulative Capacity, Actual Capacity, Operational Space Capacity, and Target Space Capacity. This course provides plenty of coaching and hands-on practice completing the various Space Census worksheets. The course contains three modules, with a total 9 lessons, each requiring 30-45 minutes to complete. Course Description: The CYS Space Census: SA/MS/T course provides information on the CYS Space Census in general and the SA/MS/T Space Census in particular. By taking the course, students gain a better understanding of the Space Census and learn how to complete a successful Space Census for School Age, Middle School and Teen programs. The Space Census includes four types of calculations: Actual Capacity, Adjusted Design Capacity, Operational Space Capacity, and Compensatory Space Capacity. This course provides plenty of coaching and hands-on practice completing the various Space Census worksheets. The course contains four modules, with a total 12 lessons, each requiring 30-45 minutes to complete. Course Description: Successful management of an installation Family and MWR program requires that a new Family and MWR manager possesses a basic knowledge of Army Family and MWR philosophy, policies, and procedures. This course provides the new Family and MWR manager with this basic knowledge. It has been targeted for all new Family and MWR managers/employees who have fiscal and program management responsibilities and are assigned to a management position for the first time. If you are new to the U.S. Army and to Family and MWR management responsibilities, this course is essential in helping you understand your work environment. ACE Recommended Credits: In the lower division baccalaureate/associate degree category, three (3) semester hours in Human Resources, Business Administration, or Management. Course Description: The Food and Beverage Management Training – Program Overview course is an online course designed to provide Family and MWR Food, Beverage and Entertainment managers with a basic understanding of the history of Family and MWR Food and Beverage Operations, current organizational awareness and how to prepare for the way ahead. Explore the historical evolution of the Food and Beverage industry as well as the orgin of Family and MWR Food and Beverage Operations. Analyze Food and Beverage Operations as an industry in Family and MWR. Investigate your program and evaluate readiness for the way ahead. Apply program standards. 5. Relate how elements of success impact your operation. Target Audience: Family & MWR Business Program Managers responsible for Food and Beverage Operations. Course Description: The Family and MWR Delivery System (DS) is designed to foster the delivery of integrated, customer-focused programs geared to each Garrison’s unique needs. By understanding customers and offering programming to meet their needs, Family and MWR-DS can increase patron opportunities in a cost-effective manner, while making more efficient use of facilities and incorporating non-facility based programming. This course will provide Family and MWR employees with an understanding of Family and MWR-DS and it’s benefits to the organization. Target Audience: All Family and MWR employees at all levels of the organization, including Recreation, Business, Lodging, Child & Youth Services; ACS; or any Family and MWR Support Service. Course Description: This course is designed to provide information on Government contracting as part of the acquisition process, the rules of Appropriated and Non-appropriated Fund contracting, areas of responsibilities in NAF contracting, NAF procurement processes for small (simplified) purchasing, NAF contracting methods, NAF contracting administrative matters, simplified purchasing, NAF contracting administration, and forms used for contracting. This is a self-paced course. It is a pre-course requirement for Army personnel applying for the Procurement for the NAF Program Managers course. Other Family and MWR program managers also take this course to understand basic contracting procedures, terms, and regulatory guidance. Target Audience: NAF Contracting personnel. Other military service branches NAF employees can take this course. This course includes a pretest which students are required to pass with 100% in order to gain a certificate (*). The course is approximately eight (8) hours in duration. This course will fulfill the COR Level I – 8 hour training requirement of “at least every 3 years” per the DODI 410567, dated April 7, 2016. There may be additional training requirements identified by the Contracting Officer and included in the COR appointment letter at the time of award. 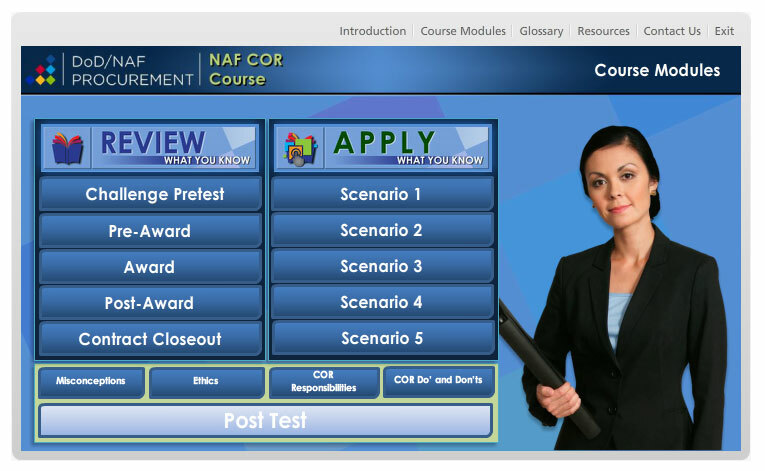 The “NAF COR Requirements and Guidance” provides additional information pertaining to COR Level I, II, and III training requirements which is dictated by contract complexity. Course Description: Operation Excellence is Family and MWR’s standardized customer service training. Family and MWR is committed to providing service excellence to our Soldiers and Families that matches the quality of their service and sacrifice. OPEX online can be used as the initial Customer Service training for a new employee or as a FY refresher if it has not been taken at any other time. Course Description: RecTrac for front door employees provides “how to” demonstrations for performing a variety of RecTrac software functions to include household inquiry; entering a household; pass registration and renewal; activity and facility registrations; point of sales (POS) functions; and processing credit card transactions. Student will perform Try Me and Test Me demonstrations to simulate performing these functions. This course takes approximately three hours to complete. Course Description: This course is a set of four (4) self-paced modules and one asynchronous module designed to familiarize the new School Liaison Officer with the responsibilities of the position. Course Description: This training provides a comprehensive overview of MWR Events planning not only sports events but for all Family and MWR events. It guides users through the processes of event design to customer market analysis, risk assessment, implementation, and post event celebration. Upon successful completion of this course Army Recreators should be able to successfully prepare and execute innovative and productive FMWR events. To receive ACE recommended college credits, students must enroll in the blended Introduction to Sports Management course, complete this online course, and write one, two page essays addressing Sports Event Planning. Please contact the MG Robert M. Joyce School for Family and MWR for more information. Course Description: This course provides a framework for the Army recreators to examine the role of sports in the lives of Solders and family members and the direct link between sports and the readiness and well-being of America’s Army. Specifically, the course content explores the history and theory of sports with an overview of the rise of modern sports and its impact on American Society and the military; the origins and structure of Army sports today; and the five-level Army Sports Program concept. Anyone who is eligible to register in the FMWR Academy Online website is eligible for admission into this course. However, the target audience is FMWR staffs who work in adult and youth sports and recreation programs. This course section consists of 3 modules which take approximately 6 hours to complete. To receive full college ACE recommended credits, students must take Sports History and Theory plus write one, two page essays. The last module is titled “Sports Fun” which has one lesson that is a game entitled “Sports Millionaire3.” Participants enjoy the challenge of this lesson! Course Description: This course addresses the basic knowledge and utilization of the Army RecTrac system. The many benefits and tools that are available for Army recreator is explained with examples provided. A brief tutorial demonstrates the advantages of the usage of the RecTrac system. To receive ACE recommended college credits, students must enroll in the blended Introduction to Sports Management course and complete this online course. Please contact the MG Robert M. Joyce School for Family and MWR for more information.